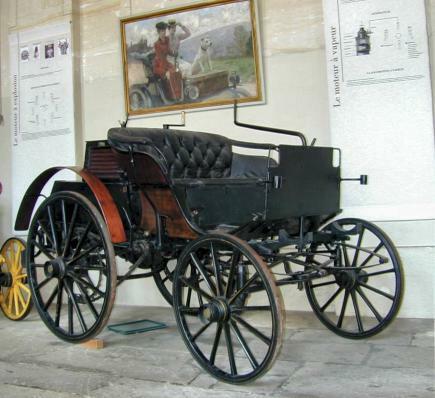 The first car designed by Panhard and Levassor in 1890 was equipped with a centrally positioned Daimler engine. A few months later, the engine was installed at the front. In the spring of 1891, Levassor himself tried out the car he had developed. When he managed to reach Versailles from the Quai d'Ivry, it was an achievement in itself. Then he had the audacity of wanting to travel all the way to Etretat with his wife. Panhard and Levassor Phaéton car, June 1891. Leaving on the 31st July, they arrived two days later after travelling 225 km at a speed of 10 km/h without incident, except for a burner failure. This provided the proof needed that the car was reliable and suitable for commercialisation; just what Panhard and Levassor were eager to do. Two years later, Hippolyte Panhard drove from Paris to Nice and back without any major incident. The car became a recognised means of transport. Book : Philippe Krebs, Bernard Vermeylen, Panhard et Levassor, pionniers de l’industrie automobile, ETAI, 2016.